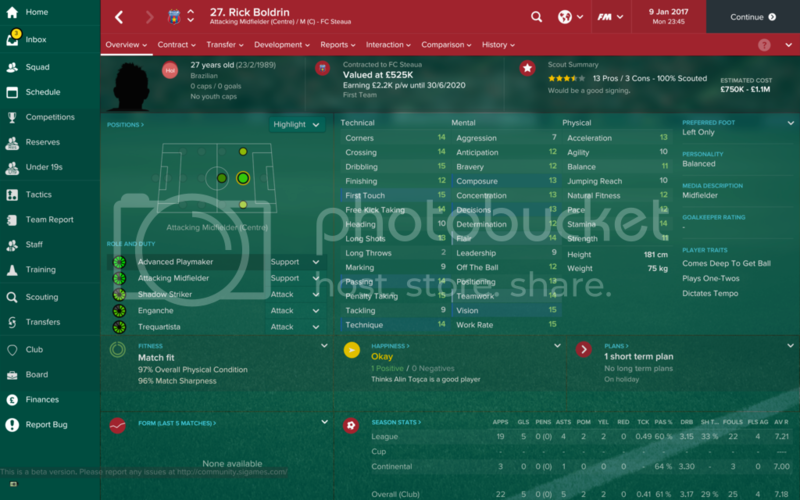 He is actually a good player, might have to purchase this guy. Hi, Angel Gomes of Manchester United turned 16 on the 31st August. Is he included on the game? That is a very good question, I hope he is. Cannot wait for the answer. He is indeed in the game. Jose Naranjo at Celta & Spain u21's looks class. 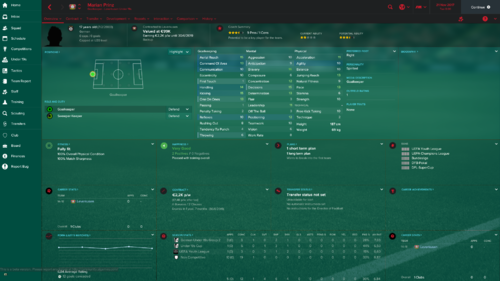 Kasper Dolberg and Mateo Casierra at Ajax were always going to look good but they will be FM17 stars. After looking at this maybe there is hope that Ethan Ampadu will be added onto the winter update. Diego Dalot - Portuguese - D/WB R - 17 - FC Porto - got him for 750k euros compensation. a bunch of top clubs are after him at start, so you should move quickly to get him. 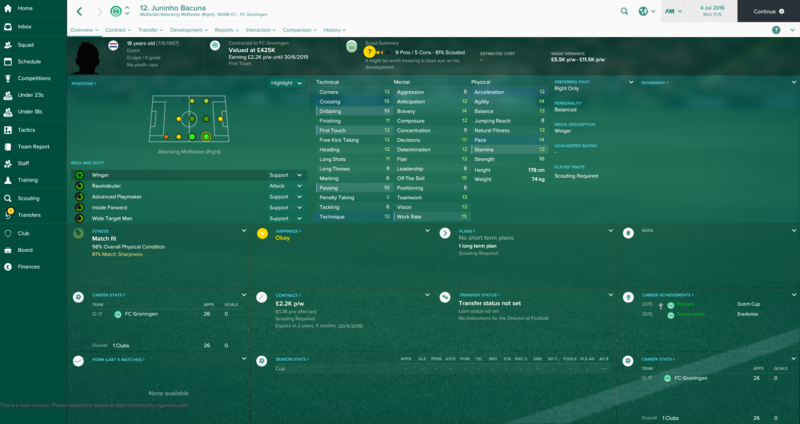 i was able to sign him for ludogorets in bulgaria, as well. 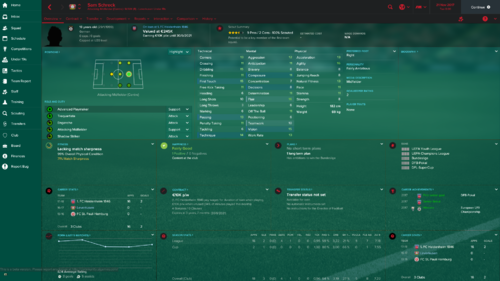 Jovan Nisic - Serbian - M C - 18 - Partizan - was good last year, this year looks even better. got him for 400k euro. 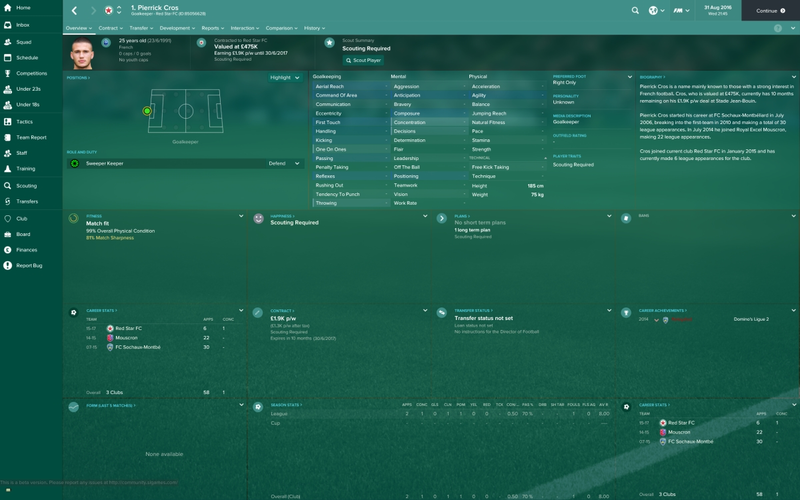 he also signed for my ludogorets team in bulgaria. 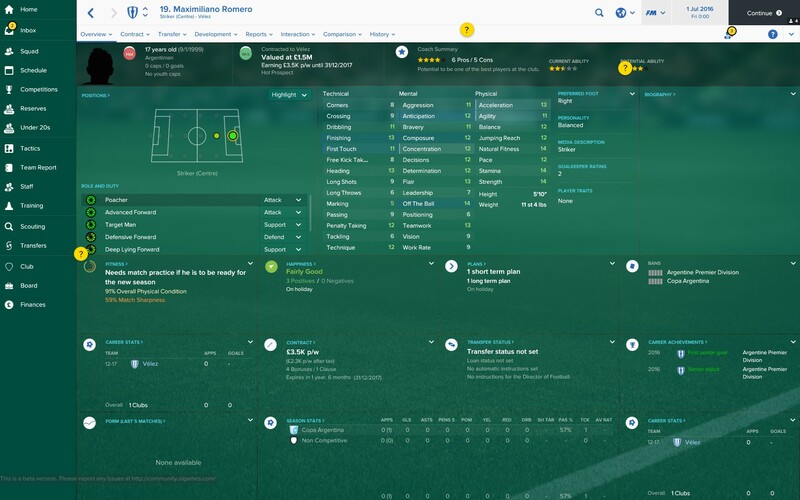 Lautaro Martinez - Argentinian - ST C - 18 - Racing Club - great base of stats for a young striker with 15 technique and 15 finishing. got him for 4 million euro. he will have some top clubs after him at the start. 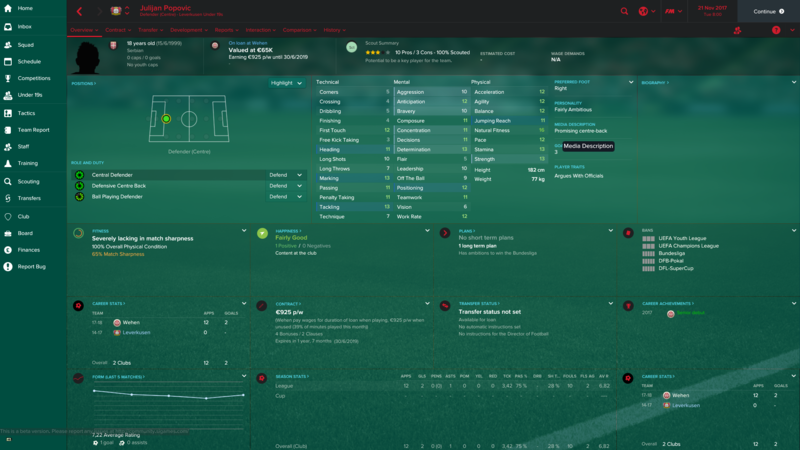 i was also able to sign him for my ludogorets save in bulgaria. 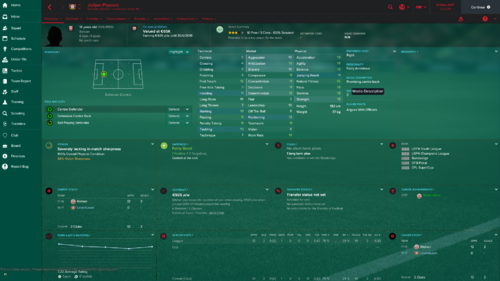 Moses Odjer - Ghanaian - DM C / M C - 18 - Salernitana - awesome looking young defensive mid, great physical stats, plus high determination and vision. 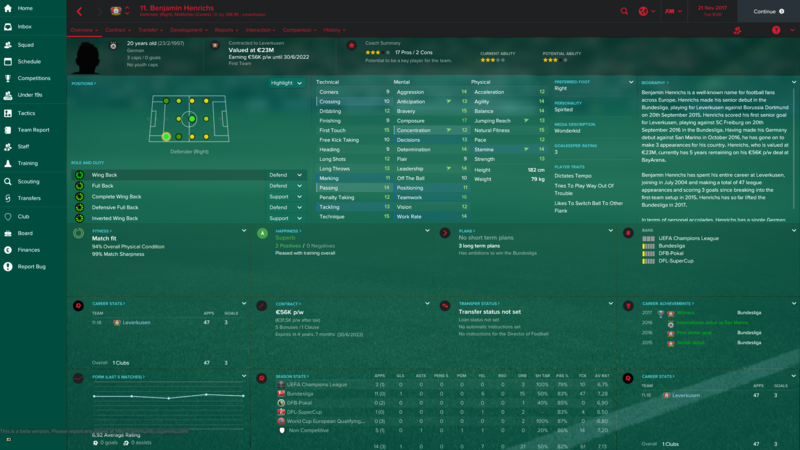 haven't bought him, but his club seem to ask around 7 million euros for him. top potential as well! Pedro Pereira - Portuguese - D R/D L - 18 - Sampdoria - One of the best young fullbacks in the game. 14 crossing, 16 determination, 16 stamina, plenty of room to grow. He isn't cheap, however. Probably around 10m euro, but its worth it. 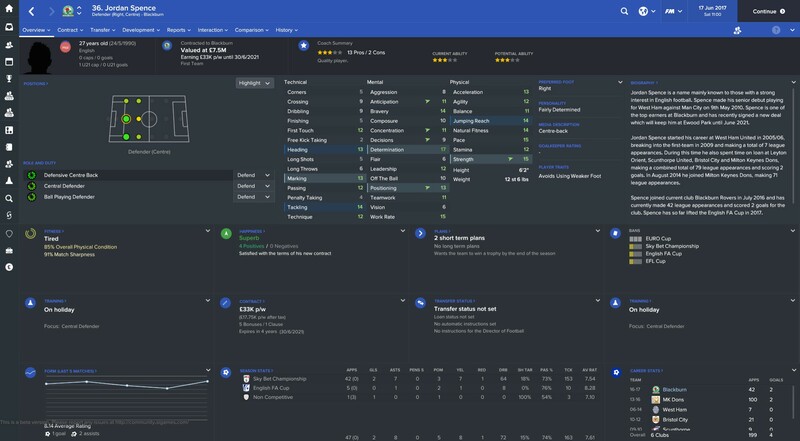 BTW he isn't on 20k/wk wages at start, in the screenshot below he signed a new contract with Sampdoria. 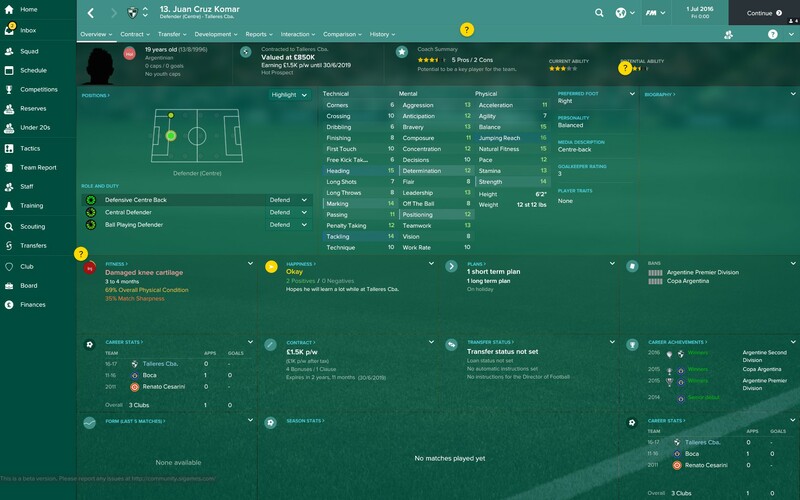 I can also confirm that Ales Mateju is well worth the money. Was great last year, now he is just amazing. Look at those stats! 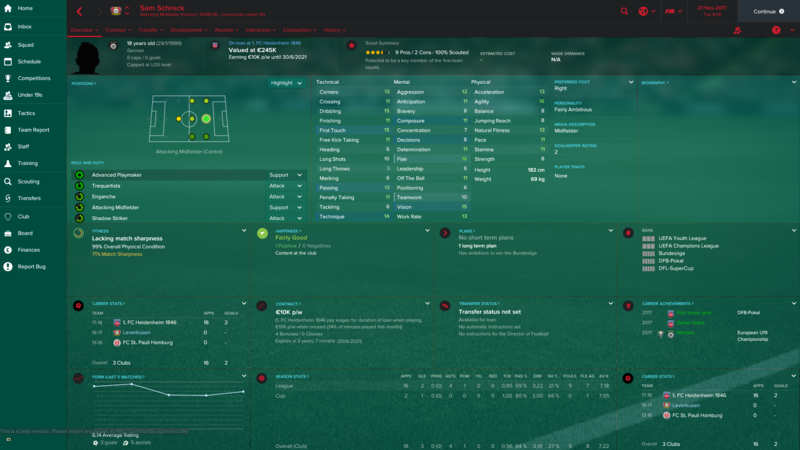 Already has 16 pace, accel, bravery, workrate, determination, 15 agility & teamwork, 14 crossing. Extremely high potential as well. 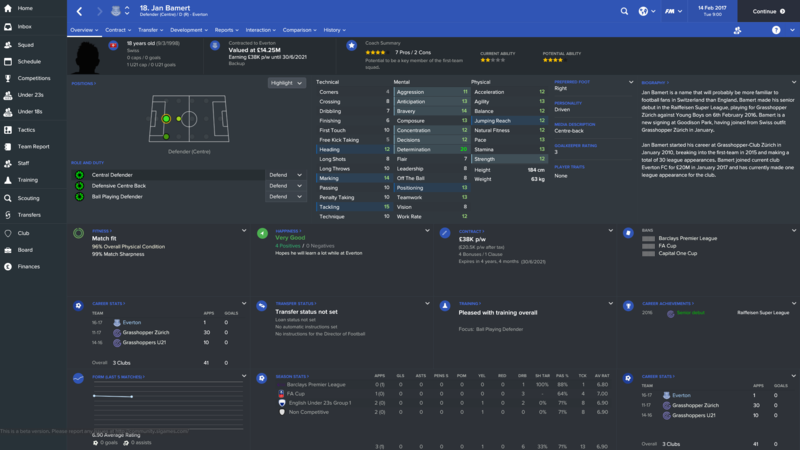 From what I've seen, he usually becomes unhappy and asks to move to a bigger club pretty quickly. Got him for around 10.5m euro. 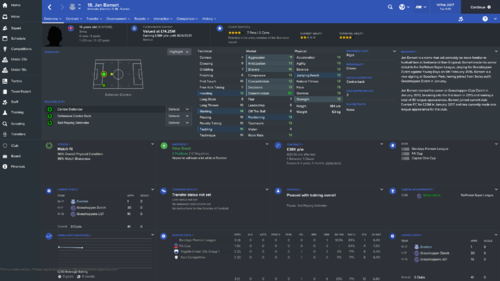 Luchkevych always got a strong recommendation from my scouts on FM16 but Dnipro wanted a ton. They have some very serious money problems in reality but I'm not sure those are accurately reflected in-game. My scouts found this guy, looks class. SS is from October 2017, not from start of the game. Jan Bamert (born 9 March 1998) is a Swiss footballer who plays for Grasshopper Club Zürich. What leagues are you guys playing with that you can find Egyptian youngsters lol? (Obviously Egyptian league) but are you actually starting games in European leagues with a lot of smaller leagues in full detail to be able to sign these players? I play with only England, Germany, Italy & Spain as playable and most of the players i've searched for here aren't in my game. Is he injury prone in your game? Usually I load up the continents (S. America, Asia, Africa, Europe) with "players from top clubs" etc. all checked to get a nice database size. Eron , Vitoria Under 20's -> roughly 1.3million depending on what you offer in the contract too. Found him just now on my Arsenal save : seems a good punt and bags of potential? 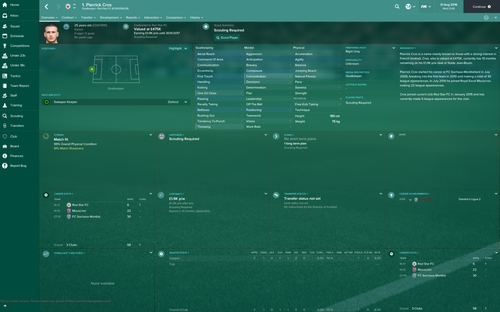 Started a save in League One, in desperate need of an AML (can be winger or IF as I have tactics for both). Needs to be free or cheap and small wage. Anyone come across any gems?! Just stumbled across this guy. Looks pretty decent. Over in Argentina, two that caught my eye were Maximiliano Romero of Velez Sarsfield and Juan Cruz Komar of Tallares, although he begins the game injured. Within a few days Man City launched a massive 150k bid for him. He's also got a host of other world class clubs after him. 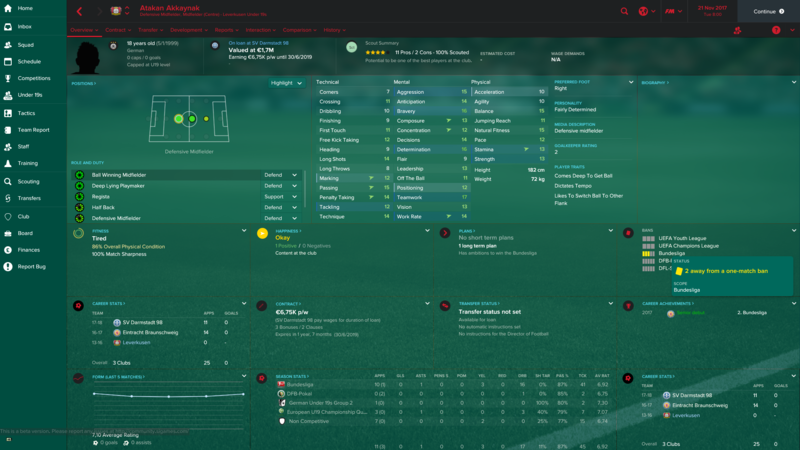 Strong in dribbling, technique, first touch, and crossing, he also has 14 off the ball. Definitely worth a look! 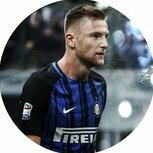 Best player in Serie A ! 2nd in the Championship is such a huge achievement for Blackburn? In my opinion? Yes.. with the squad they have. 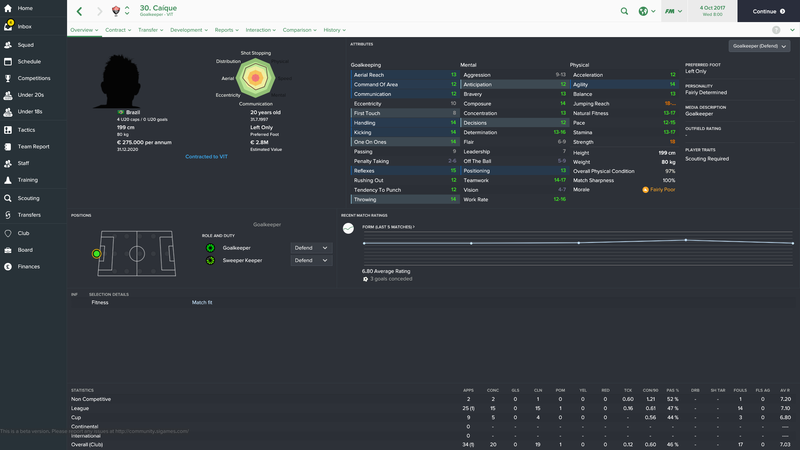 my personal wonderkid list scouted in 2022. @Welshace Are you a secret Don? First McGinn, now Rooney. Great choices, but I'm biased. 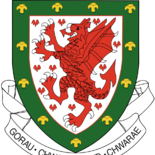 Hayes is probably our best player in 'real life', and Joe Lewis offers great stability in defence. 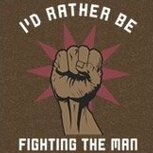 Stand Free! No it's correct, Red Star have two players called Pierrick Cross - same name, same club, different players! If I ever manage Red Star I'd have to sell one of them though, that would annoy me no end. How about Zeca for a wing back? I absolutely love the look of him. 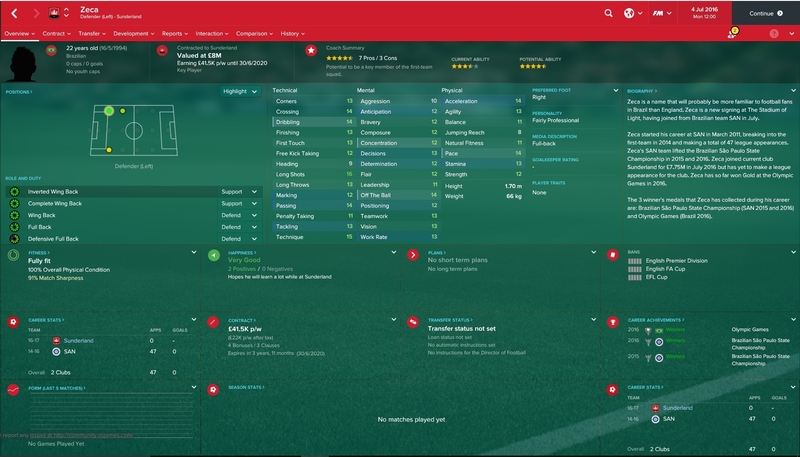 A little bit steep at £8 million, but I'm pretty sure patient negotiaters can get less for him. Couple of promising Spurs youngsters. Quite a few bargains in Scotland this year. O'Connell and the Don's players you mentioned plus Hearts have got Callum Paterson who only has a year left on his contract and Perry Kitchen who rivals Pierrek Cros as the best sub 500k CB at the start. Then there's John McGinn and Jason Cummings at Hibs.